The first of the site work parties is over. I now can’t lift my arms higher than my shoulders and I swear I creak when I move. 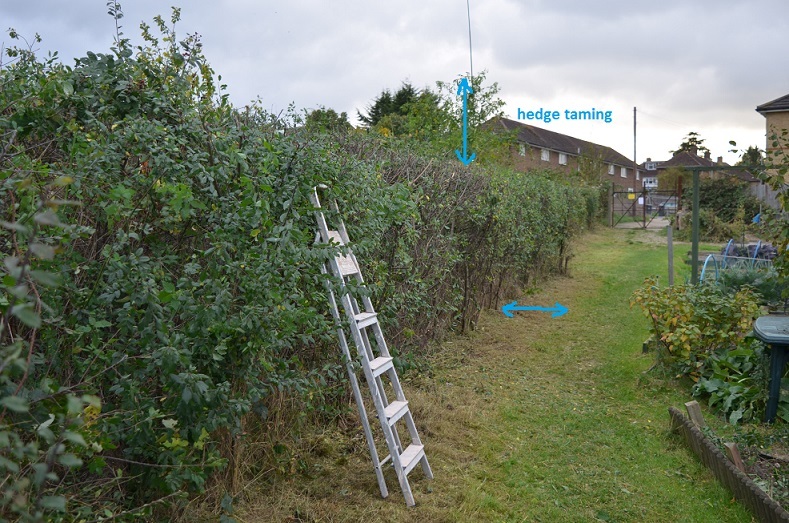 Half the blackthorn hedge has been tamed – it took us a solid 6 hours with loppers and a petrol hedgetrimmer. I’ve been eyeing it speculatively since mid September now the sun dips behind it and my plot goes into perma-shade. It grows 3-4ft per year and we couldn’t get to all of it last year. It’s also sent suckers a foot or so into the path. This year I was in my sturdiest anorak and managed to sidle through to the back with the loppers. The new year-old wood isn’t that prickly but the older stuff is pretty lethal. Despite robust clothing my arms look like I’ve gone 10 rounds with a bag of barbed wire. On the plus side, the sun isn’t blocked out anymore, my winter brassicas will be happier now they can sunbathe and the de-thorned straight bits of blackthorn make great poles. It’s not been all work parties though. Although the plots are slowly shutting down I still have a steady stream of harvests coming in. 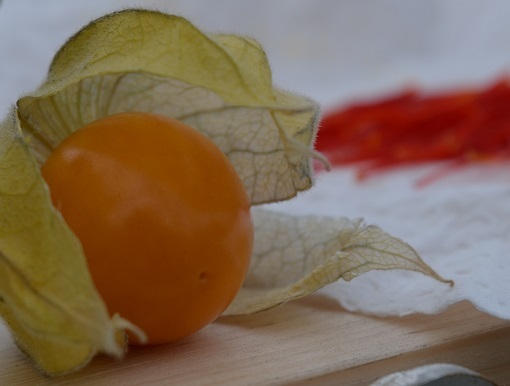 Cape gooseberries have just started ripening and they are lovely. Only one has made it home so far, the others are snaffled while I potter about. There are also globe artichokes, still some tomatoes, loads of raspberries and padrons – though those are way too hot for us to eat like tapas peppers now. 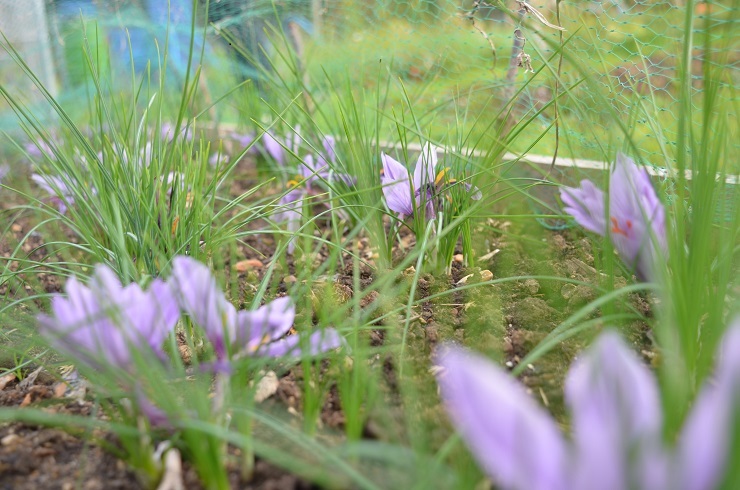 The saffron bed is still going strong, with 3-4 flowers appearing from the biggest bulbs. 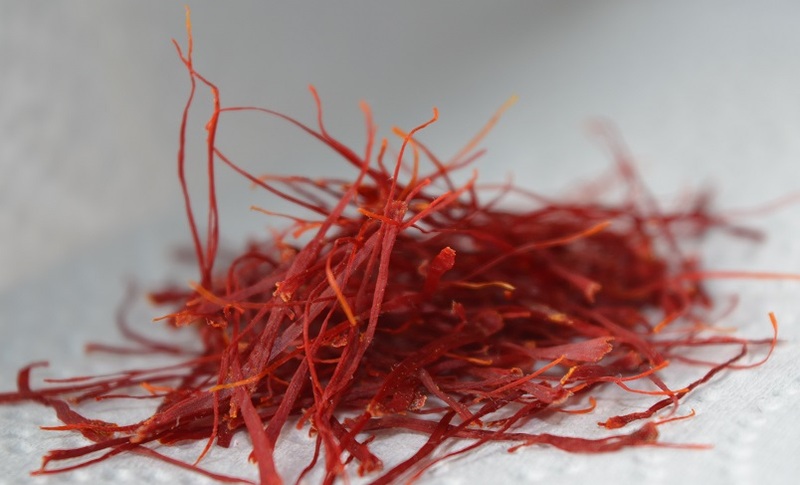 One of them had four strands of saffron, which is the saffron equivalent of a four-leaved clover. I’ve already picked far more than last year and many of the bulbs have yet to flower. So far there’s nothing from the smaller bulbs in tubs, but a couple are showing the white papery skin that says a flower is developing. Some of the shoots have been snipped off. I suspect slugs and the (organic) pellets of death have been applied. Also about to ripen are the 8 Kiwano. I have just one plant, but it’s a monster. I put up some trellis for it earlier in the year thinking that that would be enough, but the tendrils have completely swamped it and gone off to play in the beans. All the fruit are at the bottom on the ground, completely ignored by slugs and other critters. 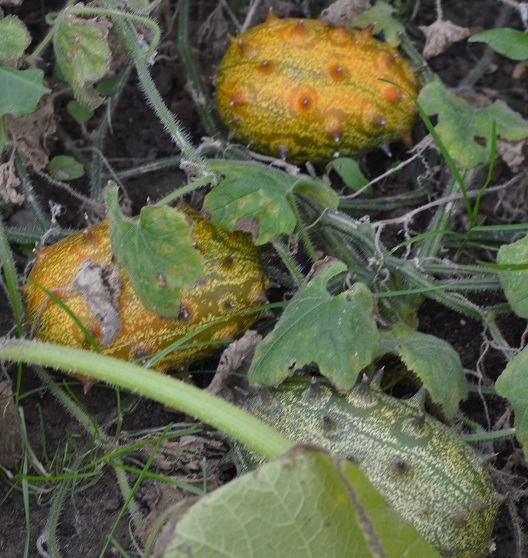 A couple are just turning orange – thankfully they will ripen off the plant if they haven’t before the frosts arrive as I want to add some into the Forum’s seed circle. And finally there are the poppies, whose heads are fattening nicely. 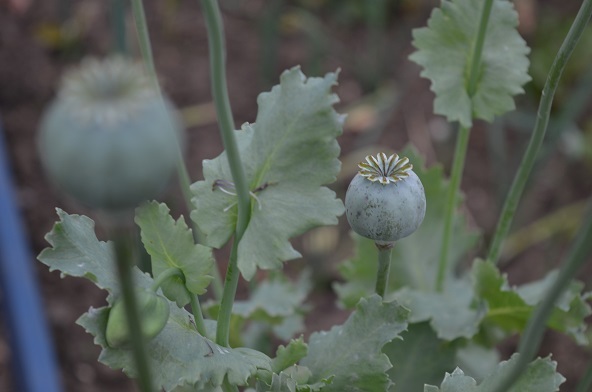 I never remember to sow enough so I can’t make much seedcake with it, but if they make it past the slugs it’s an effortless harvest and the flowers are pretty.They are proper breadseed/opium poppies, not all poppies are edible. Thanks – am quietly impressed, it’s miles better than last year. Though the littler corms are still only fronds, no flowers yet.